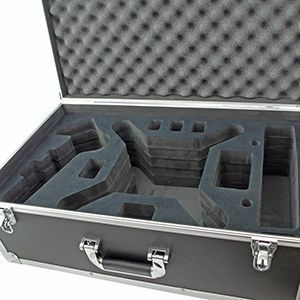 Cases and Enclosures are now offering a custom CNC foam cutting service. Using CNC cutting allows a high level of accuracy with a wider range of options compared to other types of foam cutting. Unlike other methods it allows us to create stepped pockets and very accurate intricate shapes. The design for the cut-out can be from a drawing with dimensions of the item/s to be secured in the foam or for a higher degree of accuracy we can also offer a CAD service. For a quote please contact us with your requirements and we will get back to you as soon as possible.